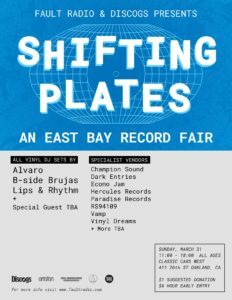 We are excited to invite you to the finest record fair to ever be held in the East Bay: Shifting Plates – An East Bay Record Fair. All vinyl DJ set by B-Side Brujas, Lips & Rhythm, Alvaro. On March 31st we will be opening the doors at Classic Cars West Beer Garden in Oakland, CA, for a day of dusty fingers and record digging. We will have over 30 vendors including Vinyl Dreams, Champion Sound Records Oakland, VAMP vintage • art • music for the people, Hercules Records, RS94109 and many more! You can bet that there will be delectable slices of disco LPs, shimmering house and techno, and of course, a fair bit of world music sprinkled throughout. Did we mention that it is free to attend? If you are a serious record collector or a curious first-time buyer we have something for everyone. Drinks, food, and music will be in constant supply throughout the day so don’t worry about getting too tired. We will also be hosting a mega raffle including Audio-Technica USA turntables, ORTOFON Vinyl Preservation Academy record needles, Discogs merchandise, and limited edition merchandise from local record labels! If you are a serious digger we are offering limited early access tickets from 10-11am for those who want to make sure they get first picks.